Classified Emails Were Sent Through Clinton's Private Network, Watchdog Says : The Two-Way The Justice Department has received a referral from an inspector general that is related to the case, but it has made no decision yet about whether it will launch an investigation into the issue. Democratic presidential hopeful Hillary Clinton speaks at a Hillary For America discussion on Thursday in Columbia, S.C. The Justice Department has received a referral to look into whether classified information was mishandled in relation to former Secretary of State Hillary Clinton's use of a private email account to conduct official business. After The New York Times first reported the story, the inspectors general of the State Department and the Intelligence Community made public memos that outline the concerns that led to the referral. The memos reveal two important things: First, that investigators found that Clinton's private email account contained "hundreds of potentially classified emails." Second, the investigators found that "at least one email made public by the State Department contained classified information." Andrea Williams, a spokeswoman for the inspector general for the Intelligence Community, told NPR's Carrie Johnson that at least four emails that were sent through Clinton's private email network "were classified when they were sent and are classified now." On the face of it that seems like a simple statement, but the inspector general also found that all of the emails were not marked as classified. That raises questions about how the State Department and the Intelligence Community handled sensitive information. 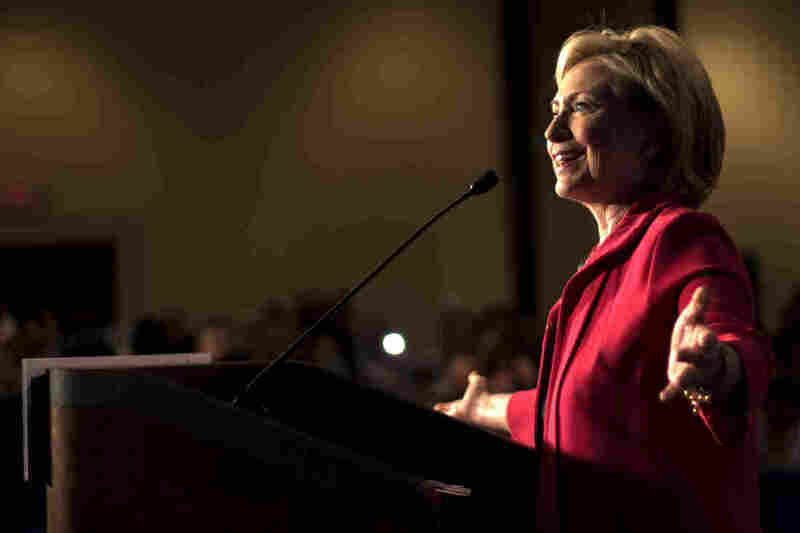 The issue of Clinton's private email account has cast controversy over her burgeoning presidential campaign. Clinton, however, has always maintained that she did not break the law when she opted to use a personal email account instead of a State Department account to conduct official business during her tenure as secretary of state. "I did not email any classified material to anyone on my email," Clinton said at a news conference in March. "There is no classified material. So I'm certainly well-aware of the classification requirements and did not send classified material." The Clinton campaign issued a statement on Twitter Friday, reiterating that point. Campaign spokesman Nick Merrill said that Clinton had followed "appropriate practices in dealing with classified materials." He added: "As has been reported on multiple occasions, any released emails deemed classified by the administration have been done so after the fact, and not at the time they were transmitted." I. Charles McCullough, the Intelligence Community inspector general, seemed to characterize that differently in a Thursday memo to lawmakers: "We note that none of the emails we reviewed had classification or dissemination markings, but some included IC-derived classified information and should have been handled as classified, appropriately marked and transmitted via a secure network. Further, my office's limited sampling of 40 of the emails revealed four contained classified IC information which should have been marked and handled at the SECRET level." It's worth noting that it is still unclear who sent those emails and that the State Department disputes the charges made by the Intelligence Community inspector general,. During his regularly scheduled briefing, deputy State Department spokesman Mark Toner said they did not believe that Clinton sent classified information through her personal email. "She's handed over those 55-thousand pages ... to our knowledge, none of that needed to be classified at the time," Toner said. "Some are being upgraded as classified now." Clinton addressed the reports during a speech Friday afternoon, saying there has been a lot of misinformation. "We are all accountable to the American people to get the facts right," she said. "But I will do my part, but I am also going to stay focused on the issues, particularly the big issues that really matter to American families." Carrie reports that the Justice Department has received a referral related to the case. The Justice Department had originally said it was a criminal referral, but they later corrected themselves saying it was non-criminal and "related to the potential compromise of classified information." Carrie reports that there has been no decision yet from Justice about whether it will launch an investigation into the State Department Clinton email issue based on the referral. Clinton's use of a private email account was first reported in March by the Times. Before the revelation, Clinton had turned over tens of thousands of emails to the State Department and eventually asked for them to be made public. The State Department is releasing the emails in batches as they are reviewed for sensitive information. Our friends at It's All Politics took a comprehensive look at the law in April. They found that whether any law was broken would likely come down to whether classified material was sent over Clinton's personal account. Update at 2:50 p.m. ET. One Or Two Referrals? There has been some confusion as to how many inspectors general have issued referrals to the Department of Justice. The New York Times originally said both the inspector general for the State Department and the one for the Intelligence Community referred the issue to Justice. But Rep. Elijah Cummings and State Department spokesman Mark Toner said that was incorrect. The Intelligence Community inspector general did confirm that it had referred the case to Justice and Justice also confirmed receiving a referral. We have updated this post to reflect this new information. Rep. Elijah Cummings, a Democrat from Maryland, tells The Hill that the State Department inspector general has told him that he did not request a criminal investigation. "'I spoke personally to the State Department Inspector General on Thursday, and he said he never asked the Justice Department to launch a criminal investigation of Secretary Clinton's email usage,' Cummings, the top Democrat on the House Select Committee on Benghazi, said Friday in a statement. "Instead, Steve Linick, State's Inspector General 'told me the Intelligence Community IG notified the Justice Department and Congress that they identified classified information in a few emails that were part of the [Freedom of Information Act] review, and that none of those emails had been previously marked as classified.'" In a memo dated June 29, Steve Linick, the State Department's inspector general, writes that there was concern that a batch of emails scheduled for release the next day contained "possible classified material." Another later memo says at least one of those emails containing classified information has been released to the public.